Just hearing the words "warehouse conversion" or "hip loft" can make our design hearts skip a beat. That might sound a tad dramatic at first, but you only have to peek inside one of these factory flips to see why. The curated yet raw aesthetic dances creatively between the minimal and the eclectic, striking a stylish balance we all want to bring home. While we love a sweet feminine vibe or that sleek minimal look, there's something about the industrial aesthetic that reels us in every time. 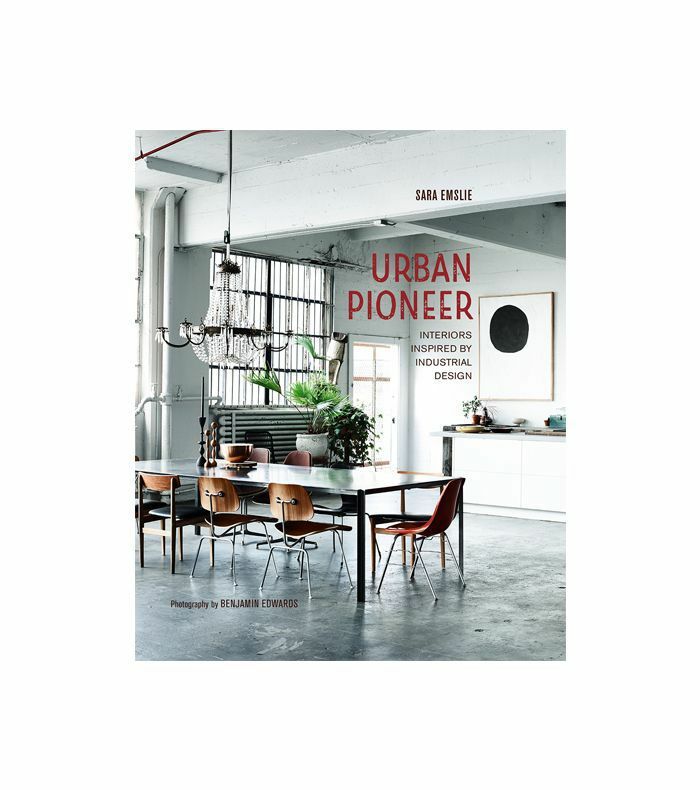 It's also why Sara Emslie dedicated an entire book, Urban Pioneer, to this time-worn and much-loved trend. "Urban pioneering first began back in the 1950s and 60s when a decline in manufacturing led to so many factories, mills, warehouses, and other inner city industrial buildings becoming vacant and attracting all sorts of artists and creative types seeking cheap rents," she told MyDomaine. "As the populations of our towns and cities continue to soar, there seems to be a second wave of urban-pioneering types seeking to convert these types of buildings into homes with a distinct aesthetic." And Emslie tells us this design trend shows no sign of abating, with everything from furniture and accessories to kitchen and lighting design undergoing an industrial-inspired rethink. "It is such a great look, and no matter whether you live, in a former factory or warehouse or a new build, a touch of industrial chic can add bags of style in an instant," she explains. "For me, as a stylist, I realized that there was more to the look than just the classic warehouse one of bare brick, concrete, and metal. Urban pioneering isn't just about the buildings. It is as much about the individual spirit and personality of the homeowners." If you're in love with this look too, then read ahead for Emslie's advice, inspiration, and style tips à la industrial to create the insanely cool look for yourself, no matter where you live. MYDOMAINE: What are the distinctive characteristics that define an industrial space? SARA EMSLIE: Size is the most distinctive. These spaces were built to be functional workplaces, often manufacturing large-scale industrial pieces, so their interiors are vast. Even ex-industrial spaces, such as former shops or garages, usually consist of interior layouts that are very different in scale and proportion to a standard residential space. Also, materials used in their construction—rough textures such as brick, concrete, metal, and wood—are usually in abundance and if retained and restored can add tons of charm and authenticity. MD: For those of us who love the industrial look but don't live in an old factory or loft warehouse space, how can we re-create it at home? Exposing brickwork, for example, can add an element of warehouse style. Old brick, in particular, will be full of imperfections and knocked around a bit—retain this and add character in the process. Reclaimed timber flooring is great for adding some industrial style, and if it has a rough patina that shows signs of age, hang on to it and enjoy its time-worn scuffs and marks. Add a dash of utility chic. Source items that are full of classic utilitarian charm and that were functional items designed with a practical and hard-working aesthetic. Factory pendant task lights, pendant shades, and old-fashioned Bakelite switches are all enjoying a renaissance and look great in a modern home. So, too, are canteen favorites such as Duralex glass tumblers, stainless steel cookware, and practical glass storage jars, which were all built to last and can add some utility chic to a modern kitchen. Take inspiration from the robust structures of warehouses, such as metal joists, solid timber, and even scaffolding poles, and source furniture items such as tables, benches, and shelving units that have been engineered with as much precision and force as an iron girder. Large-scale pieces will make a visual industrial statement and add drama to any room. MD: How can we marry the modern/contemporary styles with the vintage industrial design without losing its former beauty and patina? SE: Make the most of any defining original features, and work with them rather than against. Restore them to their former glory, and retain any markings from the past that hint at the rich heritage of the space. Large warehouse or loft interior spaces can be daunting if they're left too open-plan, so add interest and practical purpose with architect-designed internal pod structures or dividing internal walls that don't detract from original structural features. Play around with classic industrial materials, such as metal and wire mesh glass, to make screens and glazed partitions. Introduce some contemporary style with iconic furniture and lighting designs in modern-day bright colors, such as Tolix chairs, factory pendants, and flex lighting. Source contemporary designs of old-fashioned encaustic tiles that were popular factory flooring choices and use them to introduce pattern and visual interest. Embrace one of interior design's favorite trends, "rough luxe"—a sublime and desirable amalgamation of the rough and the smooth. There's a great former bakery conversion in Amsterdam that marries smooth, shiny metals such as copper and brass with roughly hewn timber and exposed brick walls. MD: What furniture styles, brands, and designers truly evoke the industrial look and feel? SE: There are so many, from the original manufacturers still in production to modern-day interpretations. Favorites include Tolix tables and chairs, Anglepoise lamps, Jielde Signal lamps, machinists' stools, old-school-style cast iron radiators, vintage metal gym lockers. Brands to look out for are Original BTC Lighting, Plain English Kitchens, Schoolhouse Electric, Puebco, Industrial Home, Long Made Co.
MD: What are some decorative finishes we can incorporate at home to cement the urban pioneer look? SE: Vintage tin tiles scream industrial chic, as do metro tiles for bathrooms and kitchens. Try metro tiles teamed with a section of bare brick for a quirky juxtaposition of old and new, as demonstrated in the bathroom of a former garage conversion in Urban Pioneer. Look out also for modern-day reinterpretations in printed wallpaper designs of concrete, brick, and rusty metal. MD: Lighting is key to bringing much-needed warmth to these large, open spaces. What lighting truly evokes the industrial look? SE: Ceiling lighting for factories and industrial spaces is often large in scale, as it was designed specifically to illuminate the large factory floors. Classic pendant shades are in spun aluminum and a range of muted industrial colors such as black, green, and blue, and can add some factory flair to a room in an instant. Similarly, maritime lighting designs evoke industries of the past and were built to withstand the elements, so they are ideal for urban pioneers' bathrooms and kitchens where there is often an increase in condensation. Look out for caged bulkhead lights and passageway lightsfor a classic look. Task lights were designed to illuminate office desks and architects' drafting tables. Favorites like Anglepoise never fail to add some industrial chic. Also look out for contemporary lighting designs that echo the clean lines of traditional styles. Rod-style chandeliers that are teamed with retro filament light bulbs are ideal for creating a design statement in a room with high ceilings. MD: What are the colors you recommend for everything from paint to furniture and throw pillows? SE: The urban-pioneer style can really embrace any color, but the classic industrial shades work well. Warm terra-cotta tones, the natural hues of undyed linen, and monochrome black and white work well, as do woody tones and metals. Urban pioneers know to take inspiration from the classic palette and use it for creative effect. So, for example, an Art Deco factory conversion featured in the book has introduced gold metallic tiling as a nod to the classic industrial metal tones but with an exotic twist in the form of elaborate Moroccan style tiles. Similarly, the waterside location of a former Navy canteen featured in Urban Pioneer inspired the palette of fresh blues and greens in the kitchen to create a beautifully uplifting and refreshing space that nicely connects the interior with the view over the harbor outside. MD: Are there certain materials that define the urban pioneer trend? How can we incorporate them? SE: Urban pioneers love utility fabrics such as calico, ticking, linen, heavy duty cotton, and canvas. Use them to cover sofas, chairs, and as soft furnishings. Use as curtains and screen dividers. They also love upcycling quirky materials and giving them a new use. There's a great modern-style apartment in New York's Chelsea district featured in the book where the owner has upholstered the headboard and base from old transit blankets usually used to protect furniture during a house move, and it looks amazing. And in a Brooklyn warehouse, old Swiss army blankets are used as loose covers on a sofa. MD: With so much cement and metal, what are some ways we can ramp up the natural elements and bring the outside in? SE: Create an indoor urban jungle and use an old metal trunk or something similar to display houseplants. A schoolhouse conversion in Urban Pioneer has a large terrarium—an indoor greenhouse structure that enables plants to grow and look good too. Introduce natural textures with wicker baskets, woven rush, and coir matting. MD: What is the number one design rule every urban pioneer space should follow? Why? SE: Be creative and inventive, be bold with your ideas, and always be inspired by industrial design—it's too good not to! MD: Anything else you'd like to add? SE: Take time to visit salvage yards, antique fairs, and bric-a-brac shops to uncover some really unique and interesting finds. So often, the joy is in the discovery and it's a great way to really make the space your own. What are your favorite interior design styles? Is there a theme or trend you're loving right now? Let us know in the comments below.